A few months back, Damian and I were talking about the concept of “last meals”. If you were on death row, what would you choose for your final supper? It’s a tough question! I was super stumped for the longest time, days actually, but I was having fun pondering. I would think of a food, and then imagine how that food made me feel. That’s how it finally came to me. There is nothing, not even close, nothing else in this world, that gives me the same warm-and-fuzzy safe-at-home comforting feeling, as my OtherMother’s homemade chicken and matzo ball soup. Hot, salty broth (with plenty of parsley), generous pieces of fork-tender carrots and celery. And of course, those delicate, fluffy, oh-so-soft dough balls. That is my dying wish of a meal. And so I set about recreating it – veganized of course! – just in time for Hanukkah. I know that matzo ball soup is more often eaten for Passover, but I really associate it with this holiday. If you’re more of a traditionalist, just bookmark the recipe for spring. Also, I know that there’s quite a few vegan matzo ball recipes floating around the Internet. I know because I’ve tried most of them over the years, and unfortunately, I’ve had nothing but failures. My matzo balls always disintegrate into matzo fluff! Figuring out an egg-free matzo ball was not an easy task, but I finally did it, and these babies are well-bound. They’ll stay together, I promise! The night before or morning of: Make your “eggs” according to instructions on the package (for flax eggs see here) and place in the refrigerator to set up. In the meantime, place the tofu and oil in a food processor and combine until smooth. Add the matzo meal and “eggs” and blend completely. Place this mixture in a bowl, cover, and refrigerate for at least 6 hours. To make the soup: Line a cookie sheet or baking pan with parchment paper. Using water-wet hands, form the chilled matzo dough into balls, roughly 1-2 inches in diameter. Pace them on the parchment paper-lined tray, then put the tray in the refrigerator to keep the matzo balls chilled. In a big soup pot, heat the vegetable broth, bringing to a boil then reducing to a slow simmer. Meanwhile, set a large skillet over medium heat. Add oil for sautéing, then add the onion. Sauté until glassy. 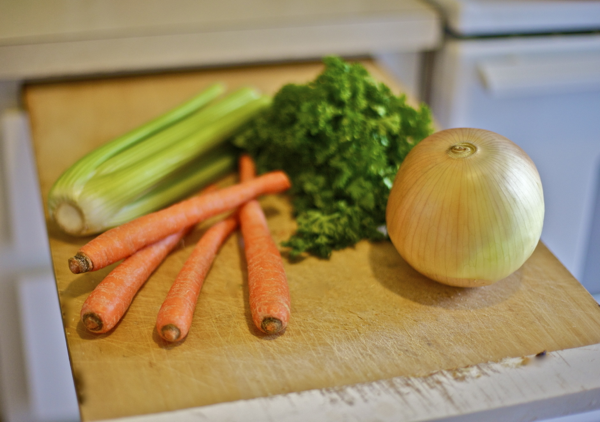 Add the carrots and celery and continue cooking, but be careful not to burn the onions. Reduce heat if necessary. When the carrots have brightened nicely, transfer the entire contents to the soup pot. Stir in the parsley as well. Place the dehydrated soy curls in a big bowl. Ladle some of the hot broth into the bowl, enough to cover. Allow the soy curls to rehydrate for a few minutes, and get the sauté pan hot again. Add the olive oil, allow it to head up, and then transfer the soy curls (not the broth) to the hot pan. Add the spice mix and stir frequently. The leftover broth can go back into the soup pot. When the soy curls are nicely browned you can remove the pan from the heat. While the soy curls are cooking, remove the matzo balls from the fridge. Drop them one by one into the soup pot. It is very important to keep a LOW simmer. If there’s too much action the matzo balls won’t make it, so no rolling boil! Once all the matzo balls are in, cover the pot and keep that lid tight for 20 minutes. After 20 minutes, remove the lid, add the soy curls, stir, and serve. Garnish with a bit of parsley. This recipe is a *spot on* recreation of my OtherMother’s chicken and matzo ball soup, which I used to eat and eat and eat until I had to unbutton my pants. Comfort food at it’s absolute finest, as far as I’m concerned. I hope you enjoy it as much as I do! Hummus and pita bread for the app, tofu tikka masala for the main dish, and pecan pie for dessert. Oh yes, I’ve thought this through. My mother’s lasagna done my style (more garlic-y tomato sauce and spinach instead of meat), followed by a piece of cheesecake. After that, I don’t care WHAT happens to me. Oh my yum!! Now that is the perfect cold weather food! Would you believe I’ve never had matzoh ball soup? And I love that napkin, it’s adorable. I’m not sure what my last meal would be, you’re right, it’s tough! The first thing that comes to mind is either a homemade vegan calzone, stuffed grape leaves, a burrito…oh the list goes on! Is there a step missing? 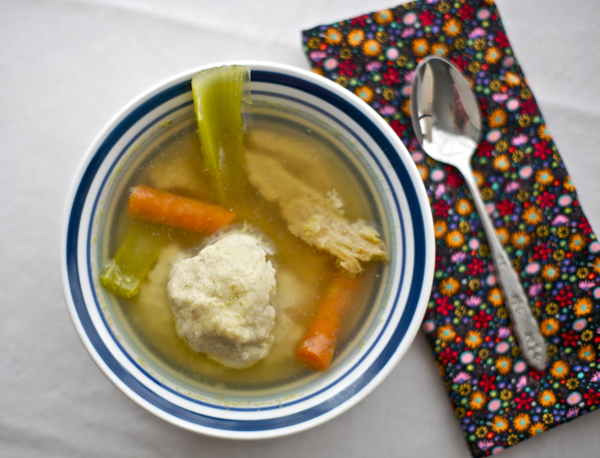 Should the matzo balls go from the fridge to the oven before into the soup? Soy isn’t kosher for passover, is it? This looks amazing, light and fluffy looking! 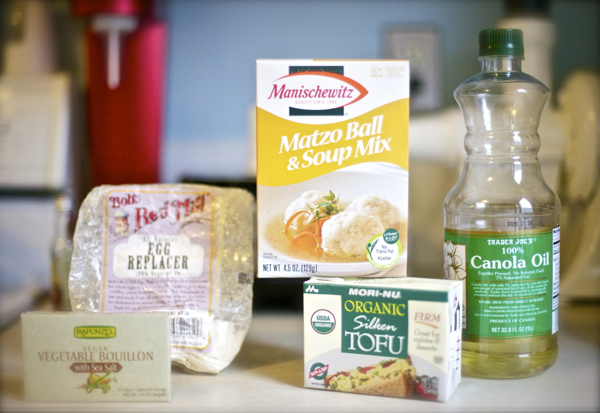 I’ve always wanted to make matzo ball soup, I will so give this recipe a shot soon! When I first went vegetarian one of the things I remember thinking I would never eat again was matzoh ball soup. Thankfully, a few months ago I made it for the first time as a vegetarian. Sometimes if I have it on hand, I brown the Gardein chicken cutlets in another pans, slice, and add it to my finished soup. I’m not Jewish (just a lover of matzoh ball soup) so keep that in mind, but I remember reading a debate about this on theppk. Basically, I think the general consensus was to ask your Rabbi. That is one easy question (for me at least). I want something new. If I’m about to kick the proverbial bucket, and I’ve got 1 last chance of getting food, I am sure as hell I don’t want to waste it tasting something I’ve already tasted! So many flavors out there! I don’t want to go before tasting them all (or at least as many as I can). Bring me new stuff. Exotic is good, unique is better, and make it dangerous too if possible. If I’m on death row anyways I won’t care. At the very least, bring me something with lots of flavor in it! To be more specific… I’d want to taste fugu sashimi, horned melon or curry from India (I’ve had only a couple of curries and I’ve loved them all, but there are sooo many variations I have yet to try). Yes, I know ordering something new as my last meal could mean I end up with something I don’t like at all, but I’d risk it… that’s just the kind of foodie I am. Last meal, eh? Toss-up between a Chipotle burrito with LOTS of guac and veggies and my baked penne with cashew cheese…..OR ooh! Pad se ew (no egg ofcourse) or this epic vegan mushroom stroganoff I had this one time and never forgot about…..biscuits and mushroom gravy? Yeah, I like eating. A lot. Too many favorite foods to choose from! Btw, why no boxed broth? This looks delicious!!! Also <3 your napkins-they're so pretty! Where did you get them from? This soup looks so warming and delicious. 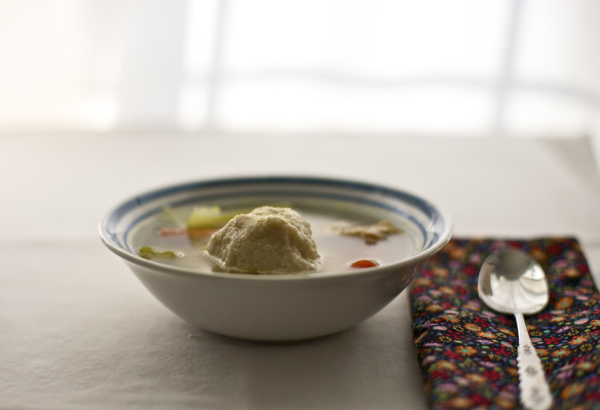 I haven’t had a lot of matzo ball soup in my life – mostly in my days as a cater waiter. I look forward to trying your recipe, and I like the addition of Soy Curls! For my last meal I’d want a big plate of wots and injera from Rahel in Little Ethiopia in Los Angeles. Oops, thank you April! That should say “remove from the FRIDGE”, not oven! I’ll change it. Thanks! Correct! (except for Sephardic Jews). Unfortunately, not kosher for Passover. I like your style Erosan. Totally worth the risk of getting something you don’t like, I agree! I feel like the boxed broth is just such an inferior flavor! It’s fine when it’s just a component of a blended soup or thick stew, like lentil soup or potato chowder or something. But when you’ve got a broth-y soup, the broth flavor really matters! I think the boxed stuff just doesn’t cut it. So true, I use this really good stock powder in thick soups, stews and tomato based stuff, but for clear and brothy I always make a fresh broth. My last meal would be a longneck (aus slang for a large bottle) of Bulmers Pear Cider and something/anything/everything Thai. Just thinking, it’s pretty hot today. If you asked me on a cold day (or, mildly chilly day, really. Gotta love South Australia) I would probably say my mum’s Minestrone. This is absolutely amazing. I’m eating it right now. Yummy! Thanks so much for the great recipe! I’m not sure what a “soy curl” is…does anyone know? Dude, You are lucky all your fans live in the city and love you. In the way out back of New Paltz, NY, the markets don’t stock matzoh meal, even at Passover and Soy curls are not on the shelves at the local health food store. For those of you in a similar boat, make your own matzoh meal by grinding matzo in a food processor or blender. As for the curls I’m using TVP. Wish me luck. Thank you for this recipe! 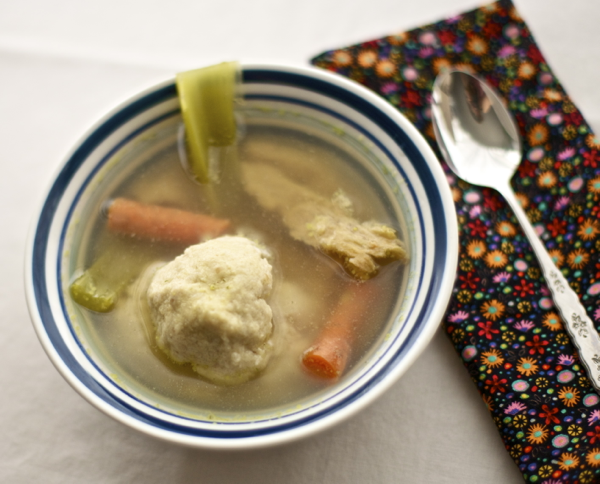 My daughter is vegan and I tried all sorts of Matzo Ball recipes that always imploded upon hitting the water. I’ll use your recipe this year. I’m intrigued. I tried replacing egg with egg replacer in the matzah ball mix and that was a disaster. Clearly it needs a recipe all of its own – so I’ll try this. But one question, what’s a soy curl and where do you get them? Hi Rachel! Soy curls are these amazing little soy products made from dehydrated and pounded soy beans. They resemble chicken but are MUCH less processed than other “faux chicken” products. You can get them on Amazon here. Luck! Pingback: Oy Vegan Top 5 Passover Recipes! 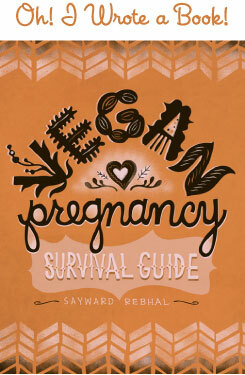 » Oy Vegan! I was so thrilled to find this recipe. I really missed matzo ball soup, especially since my mother still serves it every year for any jewish holiday and I’ve had to smell and watch and but on a brave face!! ;) I made it today. As I told my sister, it was happiness in a bowl. I had cake matzo meal and whole wheat farfel; so improvised and used half of the cake meal and half ground farfel. Very delicious but my matzo balls were definitely on the dense / harder side, do you think that it is because of the ingredients I settled for, or the way I executed one of the steps…..? In any case, I will DEFINITELY be making this again. Thank you very much. Pingback: 9 Vegan Soups And Stews For Fall | シ最愛遲到.! Dude! I didn’t think I would ever have matzo balls again! Bravo! This soup is amazing! It was my little lady’s first ever matzo ball and even though she is sick and even Refused Ice-cream (!!!) today she are a whole ball. I’ve tried other popular veganized versions that fell apart :(. This recipe I had no problems with and lived the addition of soy curls. Hard to spellcheck on the phone!